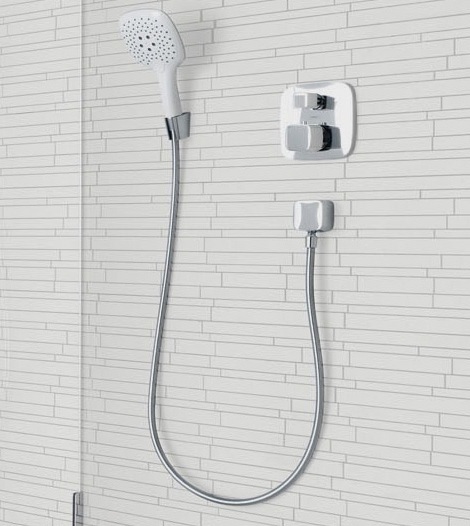 I've written before about Hansgrohe's PuraVida shower. I gave it my Best in Show Award in the days following KBIS last April and some time after that post appeared, Hansgrohe sent me a PuraVida hand shower of my very own. It remains the highlight of my morning every day. Here's my review after having used it for a couple of weeks. The PuraVida hand shower is but the tip of the iceberg when it comes to Hansgrohe's PuraVida collection and is in fact not the primary fixture. That honor belongs to the PuraVida lavatory faucet. 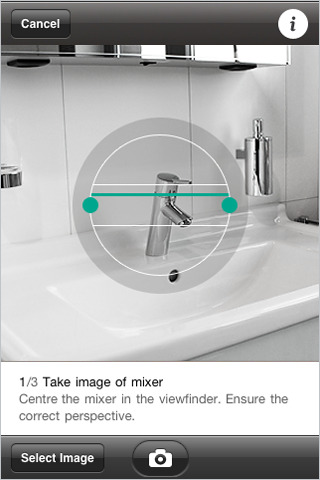 Well, if you're an iPhone user, then Hansgrohe has an app that will let you preview how a PuraVida lavatory faucet would look in your bathroom. It's pretty slick and here's how it works. 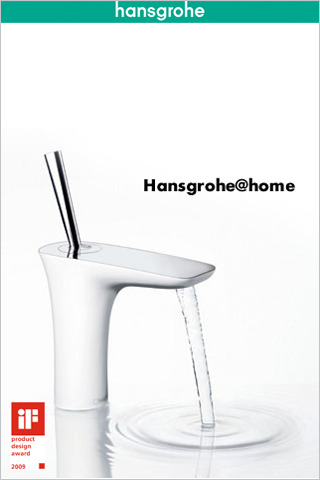 First, follow this link and download the Hansgrohe app, Hansgrohe@home. 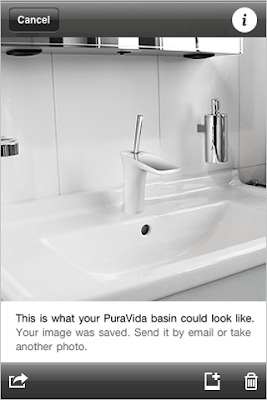 From the home screen you can watch a short video about PuraVida, look over the whole collection, or use the graphics tool to install a PuraVida lavatory faucet in your own home. To use the graphics function, launch the Planner. Your iPhone's camera will launch automatically. Line up the on-screen guide and take a photograph of your bathroom sink. Then once you have the photograph, draw over your existing fixture with your finger tip. Hit the Next button and a PuraVida lavatory faucet will appear over your photograph. Use your fingertips to scale and orient the fixture correctly. Then hit Next again. Et voila! Actually, make that Und da ist es! 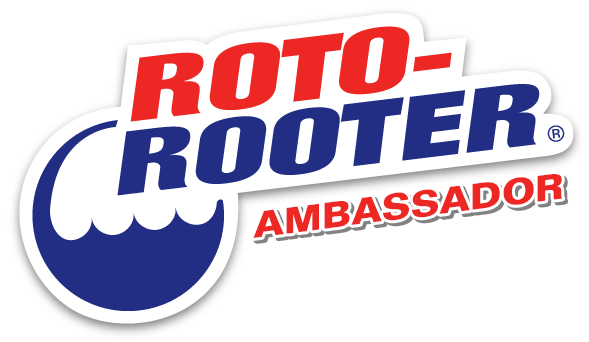 This is a German company we're talking about after all. 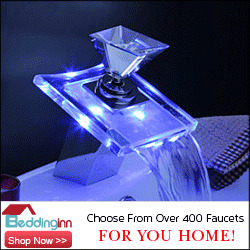 What ever the language though, now you can see what a PuraVida lavatory faucet would look like in your own bathroom. Great use of technology Hansgrohe! 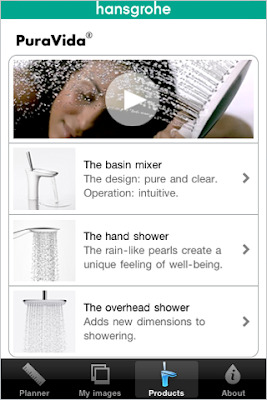 If you're intrigued, go download Hansgrohe's new app and take the PuraVida lavatory faucet for a test drive. 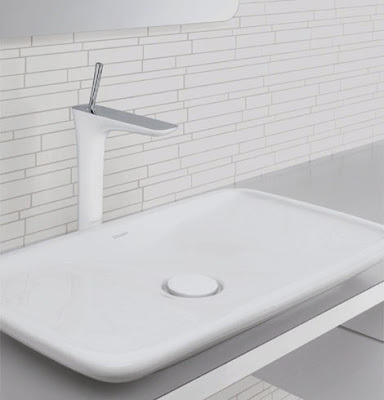 I love the idea of the iphone app to put in your favorite sink! I hope more manufacturer's go this route with interacting with the consumer. Great post! Thanks and I agree. There are a couple of manufacturers out there with clever iPhone apps. Have you played around with Benjamin Moore and Sherwin-Williams' color specifiers? 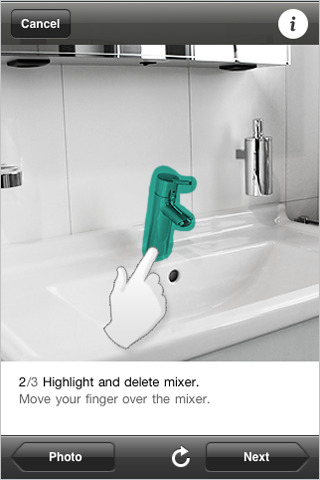 Delta Faucet has a pretty clever one too. They're out there and you're right, more manufacturers need to get on board and take advantage of mobile technology. I love that fixture as well but I am only a lowly architect who writes a trifling blog about Japanese erasers and Modernity (on special occasions). I will have to check out that app while I dream of the day that Hansgrohe sends me a PuraVida hand shower of my very own. Raina: Today is already the past.